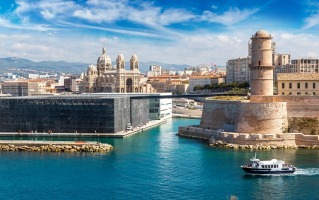 Known for its glitzy south coast, culture-laden cities and gastronomic delights, France draws tourists from all over the globe. Venture out in one of our hire cars to explore charming towns, picture-perfect villages and big cities as you discover why the country tops so many must-see lists. 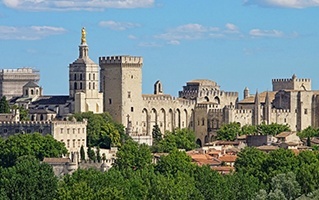 With around 250 Hertz pick-up locations across France, including major cities such as Paris, Nice and Bordeaux, as well as key airports and train stations. We’ve made travelling this beautiful country both simple and convenient. Whether you want a functional family car for a holiday or a top-of-the-range vehicle for a business trip, our extensive collections will have a rental car to suit. 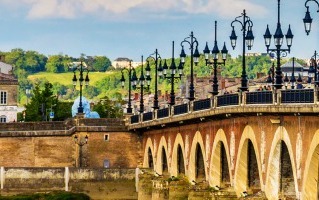 Boasting decadent cuisine, unique culture and breathtaking scenery, France has that special something that keeps people coming back for more. There’s perhaps no other country in the world quite so synonymous with fine dining as France. The variety of regional cuisines means you can savour delicacies that are unique to wherever you are in the country. Marseille boasts southern specialty bouillabaisse – a dish that combines a tangy tomato base and fragrant herbs with fresh, delectable seafood. Paris is France’s gastronomic heart. Head to one of the countless cafes and brasseries to tuck into some true Parisian favourites. Steak frites pairs a succulent slab of beef with crispy fries, while a gooey croque-monsieur is filled with melted cheese and ham, layered with béchamel sauce. If you’re looking to make it a special occasion, head up to the second floor of the Eiffel Tower to dine at Le Jules Verne. Contemporary French cuisine is an art form at this famed restaurant. Take your taste buds on a journey through a multi-plate tasting menu put together by celebrated chef Alain Ducasse, while gazing at the beautiful sights of Paris below you. Northern France, particularly Normandy, boasts rich cream-based dishes and some of the best seafood in the country. Moules marinières – mussels in a cream and white wine sauce – is one dish that perfectly marries the two. Eat like the locals, and use an empty mussel as a tweezer to pluck the meat from the other mussels. Be sure to mop up the delicious sauce with a hearty hunk of fresh bread. Each region, and sometimes even village, tends to have its own variety of cheese, cured meat or wine. Take your taste buds on a regional road trip and experience the flavours that give each area their own culinary identity. Pay homage to France’s rich and varied history, and seek out famed landmarks and museums overflowing with intriguing exhibits. In Normandy, see for yourself the infamous beaches where allied forces landed in World War 2. Amble along the serene coastline, taking a moment to soak up the beauty of the scenery and its historical significance. Paris is known around the world as a cultural hub. Get your culture fix at the Louvre and study the Mona Lisa, wondering for yourself what lies behind that inscrutable smile. Then hit the hip area of Montmartre in the north of the city to enjoy the stunning vistas across Paris from the ornate white Sacré-Coeur Basilica. You can even step back in time to the days when the can-can was all the rage by spending an evening enjoying a rip-roaring cabaret performance at the Moulin Rouge. In sun, in snow, or in-between – France has heaps of things to do no matter the season. 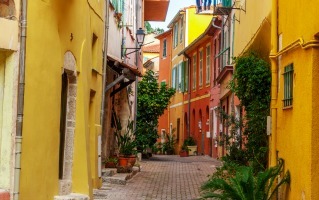 Nice, St. Tropez and Cannes make up the French Riviera on the south coast, offering glorious sunshine along with glamorous restaurants, chic boutique stores and golden beaches. Take a stroll around the winding streets of Nice’s old town, before meandering down the famed Promenade des Anglais. Lie back and soak up the sun on the idyllic, golden beaches while watching the calming waves. Seek out the one of the best skiing experiences in the world, and take a trip to the Alps. Explore the sophisticated Val d’Isère, discover the rustic Courchevel or soak up the charm of provincial Serre Chevalier. If you’re a seasoned skiier you’ll get a thrill sailing down steep inclines while navigating hairpin turns on the challenging ski runs. For newbies – get some guidance from an expert instructor at your resort of choice. They’ll get you up to speed and off to a smooth start in no time. The choice is yours, but wherever you end up going, it’s all the more convenient with car hire in France from Hertz. The French road network comprises a vast series of interconnected motorways, also known as autoroutes, making road travel easy and convenient. 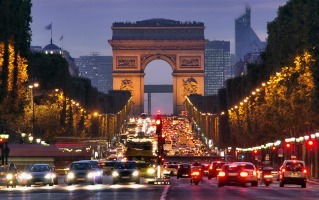 And thanks to the numerous autoroutes flowing into Paris, it’s a great starting point for onward travel. 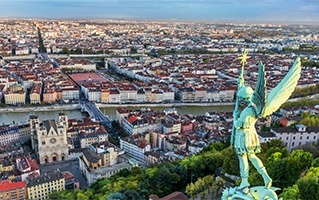 If you’re heading southeast from Paris, the A6 will take you to beautiful Lyon. If you’re heading north to get the ferry to the UK from Calais, you need to head for the A16. Speed limits vary from 50km/h in built-up areas to 130km/h on the autoroute network, but if you’re on a dual carriageway with a central reservation it’s 110km/h. Outside of built-up areas, the speed limit is 90km/h. Be aware that speed limits in France vary according to weather conditions and also if you’ve been driving for less than three years. So, if it’s wet or you’re a new driver, lower your speed to 110km/h on the autoroutes, 100km/h on dual carriageways and 80km/h outside of built-up areas. Be sure to have all your documents, insurance and licence ready for inspection, as the French police are known to be strict on traffic laws. For full details of these, click here. As with other mainland European countries, you drive on the right side of the road in France. There are a variety of toll roads to look out for – including the A1, A10 and A13. It’s worth a look at the full list of these fees before you set off so you can plan your journey accordingly.